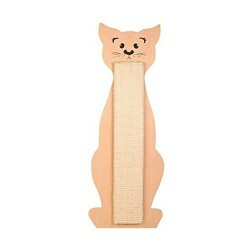 Product Details-Material- woven sisal and wood, Suitable- All Cats, Use- A healthy method to check your pets scratching abilities, Dimension - 58 x 21 cm. Product Information - Cats need scratching boards to help them tone their muscles, to remove old nail sheaths from their claws and to help relieve stress. This one is made from woven sisal and wood. Scratching post with cat outline will be a treat for your cat The perfect place for your cat to let out his inner-tiger,The scratching post makes a nice addition to your home.